The photograph’s that you wish you took, the camera to take those pictures you wish you had, the timing and talent…yes I admit there is a tiny bit of jealousy looking at these absolutely glorious pictures – but it’s all good. Today I was able to catch the WPY exhibit here at the ROM in Toronto before it closes this weekend. I am familiar with some of the pictures and photographers especially as they pertain to Big Cats and it was really nice to see them in person. Here are my personal favorites. Curiosity and the cat by Hannes Lochner, South Africa. This pic won as a joint-runner up 2013, Animal Portraits. 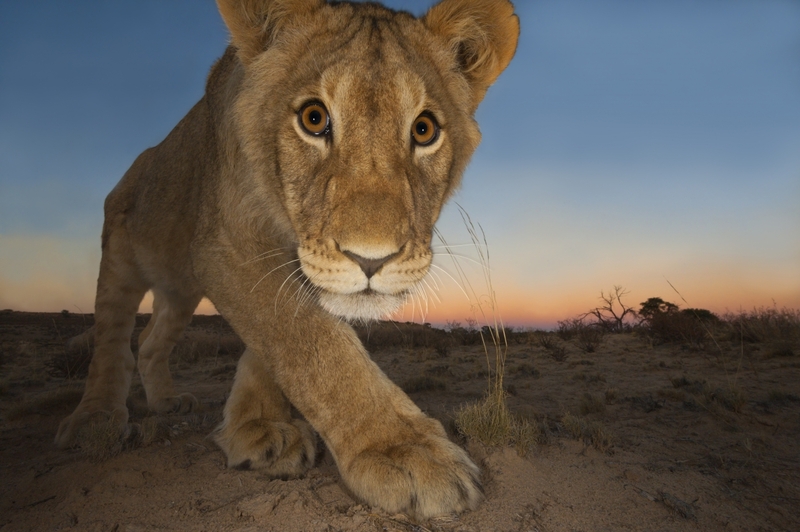 It’s an amazing up close picture of a Lion cub taken with his “remote wireless technology” allowing him to get close without being intrusive. I love the expression on the Lion and the story behind it which you can read here. The spat featuring a couple of feisty Jaguars by Joe McDonald, USA. This rare pic earned him Winner 2013, Behaviour Mammals. Sharing a shower with 2 male Lions by Michael ‘Nick’ Nichols, USA, Commended 2013, Animals in their Environment. The Winner 2013, Gerald Durrell Award for Endangered Species by Toshiji Fukuda, Japan Tiger untrapped. For this picture of the endangered Amur, or Siberian, tiger the photographer lived in a tiny cold hut for 74 days and on day 50 he got this shot. That is commitment! The Runner-up 2013 of the Gerald Durrell Award for Endangered Species, Valeriy Maleev, Russia, Survivors. This is of a rare Amur Leopard and her cubs another critically endangered subspecies. I wonder if people looking at these realize just how precious each image is, I hope it inspires others to work towards saving all of these big cats. There is still a few days to submit your own nature and wildlife photos with #ROMWPY on Twitter or Instagram. This give you a chance to see your photos on display in the museum. If you want to enter the WPY competition, adults and children under 17 can enter, you should start digging through your photo albums or… digital files now. This entry was posted in Cat Photography and tagged Jaguar, Leopards, Lions, Tigers, wildlife photography by Purr and Roar. Bookmark the permalink.